The Financial Supervision Commission has approved a minimum rate of return of 7.73% on an annual basis, resulting from the management of the Universal Pension Funds’ assets for the preceding 24-month period considered from 30 September 2005 till 28 September 2007, while for the same period of time the minimum rate of return for the Occupational Pension Funds has been determined at 8.25% on an annual basis. Bulgaria has had a colourful journey from communism to the EU. It has included the assassination of a former prime minister after he reputedly fell out with a rival faction in his socialist party, the former Soviet-era communists, over a division of the privatisation spoils. The Financial Supervision Commission has approved a minimum rate of return of 5.50% on an annual basis , resulting from the management of the Universal Pension Funds’ assets for the preceding 24-month period considered from 30 June 2005 till 29 June 2007, while for the same period of time the minimum rate of return for the Occupational Pension Funds has been determined at 5.80% on an annual basis. Instructions for the implementation of art.7, para.1 and para.2 of Ordinance No.9 of November 19, 2007 of the FSC regarding the method and procedure for valuation of the assets and liabilities of the Supplementary Pension Security Funds and of the Pension Security Companies ; the value of the Fund’s net assets; for calculation and declaration of the unit value as well as the requirements to the keeping of individual accounts. When applying art.7, para.1 of the Ordinance , the Pension Security Companies have to make a subsequent valuation of bonds, admitted to trading on a regulated securities market at the weighted average price of the concluded transactions on the preceding working day, announced in the stock exchange bulletin , and they shall add to the aforesaid price the due interest coupon as of the date of the valuation. When applying art.7, para.2 of the Ordinance, the Pension Security Companies have to make a subsequent valuation of the bonds at the highest “buying” price of the securities orders from the respective issue, valid till the end of the trading session on the stock exchange on the preceding working day, and they shall add the due interest coupon as of the date of valuation. The Deputy Chairman of the Financial Supervision Commission (FSC) as Head of the Social Insurance Supervision Division, on the grounds of art. 6 para.3 of Ordinance No. 19 of December 8, 2004 and on the grounds of art. 17, para.1, item 5 of the FSC Act, approved a technical interest rate of 3 (three) per cent, which shall be applied by the Pension Security Companies which manage a Universal Pension Fund and/or a Supplementary Voluntary Pension Fund , when calculating the pension reserves as of December 31, 2006. Recently in his session in Buenos Aires, Argentine, the Board of Directors of FIAP decided, the annual Assembly and International Seminar, to take place in Varna, Bulgaria. 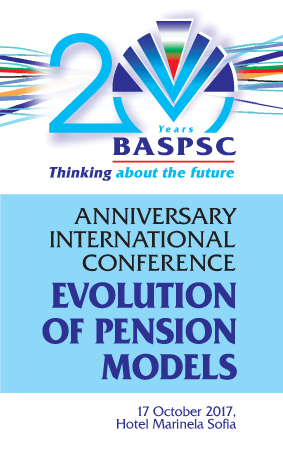 Bulgarian Association of Supplementary Pension Security Companies is approved to be the host of the events which will be in spring 2007.